Amaranthus Molten Fire Amaranthus Tricolor is a vigorous, upright growing annual. 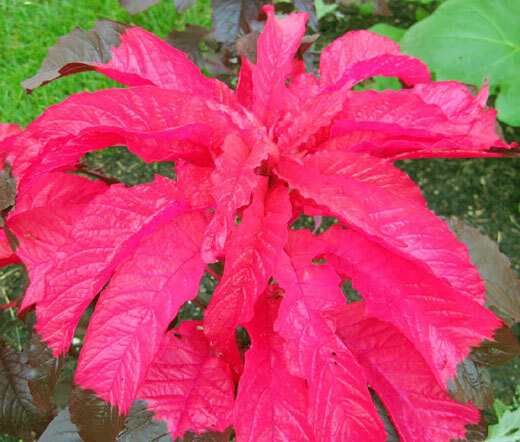 Known by other common names such as Summer Poinsettia, Joseph's Coat, and Tampala, Amaranthus Molten Fire is easy to grow from seeds, and the established plant features stunning, crimson-maroon foliage which form a fountain like, splash of leaves at the top of each 4 feet stem. Tampala has a lengthy bloom period that lasts from the middle of summer until frost. Amaranthus Molten Fire is an excellent, colorful border plant that is often used as a long-lasting filler for beds, back of a garden, or containers for patio accent. Amaranthus Tricolor likes the sun and is intolerant of shade, wet soil and frost, so warm, well-drained soil is preferable for this plant. Amaranthus makes a superb cut flower that dries very well retaining its color for an extended period of time.